Celery, a relative of parsley and carrot, has been grown for thousands of years. Stalks have been found in Egyptian tombs and it was well known to the Romans. It is another versatile vegetable that makes the base of many dishes and one we cannot do without. Celery can be eaten cooked or raw and its leaves can be used as a seasoning or a garnish. It is a biennial, growing 30-60 cm tall and spreading about 30cm. Celery traditionally has pink, white or red stems that need to be blanched. It was once considered a difficult vegetable to grow, needing to be planted in trenches, earthed up and constantly watered. Newer, self-blanching varieties need less care and produce white stems that may be partially blanched. Celery is better as a cool climate crop, growing best within 15-20oC, tolerating light to moderate frost and like most vegetables, preferring, fertile, moist but well drained soil with plenty of organic matter. 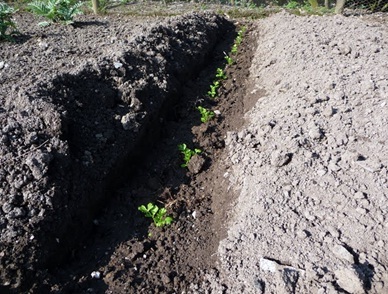 For trench celery, a trench 40cm wide and 30cm deep is needed well before planting. Work in plenty of manure or compost and replace the soil. Celery needs high levels of nitrogen. Start seeds in early spring, using pots or trays filled with fine seed mix. Follow with successive plantings to achieve a steady supply. Celery seed is very fine and should be sown lightly on the surface. The container should be soaked from below by standing in a water trough until moisture percolates to the surface. Water daily and do not allow to dry out. Prick out the seedlings into trays when large enough to handle and grow on. Plants are ready to go out when 10cm tall, plant them 30cm apart. Celery needs uninterrupted growth, unchecked by low temperatures or poor watering. Slowing of growth results in tough, flavourless stems. Feed with a balanced liquid fertiliser after a month. Place loose straw to a depth of 20cm around self-blanching varieties. 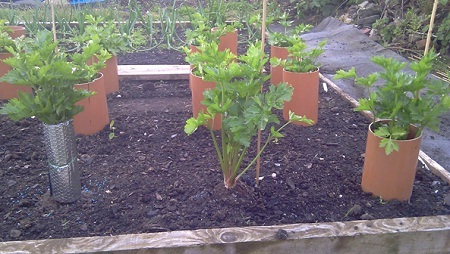 To blanch trench celery, tie the stems loosely together and earth them up as they grow. A third method is to tie a band of thick paper around the bunched stems and as they grow, tie another band further up. 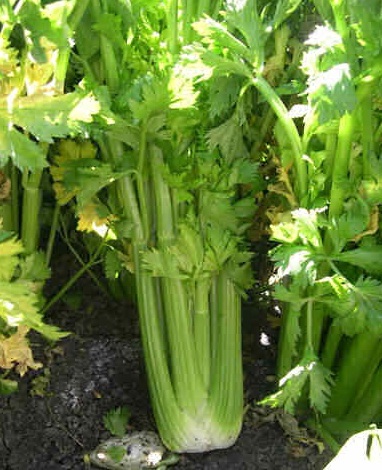 Few pests affect celery. Boron deficiency causes stunting and cracking of stems, fungal leaf spots affect the overall plant vigour as well as disfigurement. Harvest 11-16 weeks after planting. Lift with a fork and trim off the roots, cut off at ground level or pick individual stems, starting at the outside. Harvest trench celery in late autumn. Successional planting should provide stems for months.